On behalf of the members of Alpha Kappa Alpha Sorority, Incorporated®, Delta Psi Omega Chapter, I am pleased that you took the time to visit our website. Information that is included gives a brief summary of the history of the Sorority, the Chapter, and the Chapter’s Foundation as well as the focused targets of the International Program, Exemplifying Excellence Through Sustainable Service. We are dedicated to achieving the goals of the Sorority which focus on being of service to our community and to strengthen interactions with each other. Alpha Kappa Alpha Sorority, Incorporated® is the first Greek-letter sorority established and incorporated by African American college women. The sorority was founded on January 15, 1908, at Howard University in Washington, D.C. Delta Psi Omega Chapter was chartered on Saturday, December 4, 1948, in Ann Arbor, Michigan. 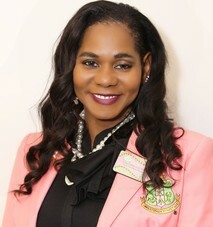 Since that time, our talented, dedicated, visionary and diverse membership has carried on the Alpha Kappa Alpha Sorority, Inc. tradition of providing “Supreme Service to All Mankind”. Our Chapter’s signature event is the Celebration of Black Men Brunch. The Brunch was created in 2001 to celebrate African American men throughout Washtenaw County who have given back to the community through service in the Arts, Business/Economics, Community Service, Education, Health and as a Trailblazer. In addition to the categories for men, we also recognize outstanding African American high school seniors as Young Men of Promise. In 2012 Pearls and Ivy Foundation, Inc. the non-profit affiliate of Delta Psi Omega Chapter, was created to handle fundraising activities that help fund our major programs and scholarships. Members of Alpha Kappa Alpha Sorority Inc. who have relocated to this area and considering reactivating are invited to join us on the second Friday of each month (except July and August) at our monthly meeting. For details of time and place, please contact us at info@akadeltapsiomega.org. In the wonderful spirit of the members of Alpha Kappa Alpha Sorority, Delta Psi Omega, I am pleased to welcome you.